Brightpearl enables bank transactions to be recorded directly against a bank account. This includes deposits, withdrawals and bank transfers. The bank receipt process can be used for money you receive in that does not relate to a sale or customer account. This type of receipt will only record the necessary accounting entries, it won't generate any physical documents, so if a receipt is required you will need to enter the payment against a customer. Money received relating to sales should have a sales order/invoice for a customer. These receipts should be processed through the customer financials or orders module and not as a bank receipt. Go to Accounting > Enter receipts. Select the bank account you want to receipt the money in to. The transaction will be recorded in the currency of the bank account. Select the account code relevant for income you are receiving. Enter the date the money was received. (With MC on) The system exchange rate for the transaction date is displayed. Amend the exchange rate as required. Enter some details about the receipt. This is for your own record, so that you know what the money was for should you need to investigate it later. Select the tax code and check the box to calculate tax automatically. To enter your own net and tax values, uncheck the box. (Optional) Use the Channel, Project and Lead Source fields for reporting purposes (these will only be assigned to profit & loss account types). Click the Enter bank receipt button. An accounting journal is created and the journal ID is displayed. Payments relating to purchases should have a purchase order/invoice from your supplier. These payments should be processed through the purchases module and not as a bank payment. Go to Accounting > Bank payment. Select the bank account you want to make the payment from. The transaction will be recorded in the currency of the bank account. 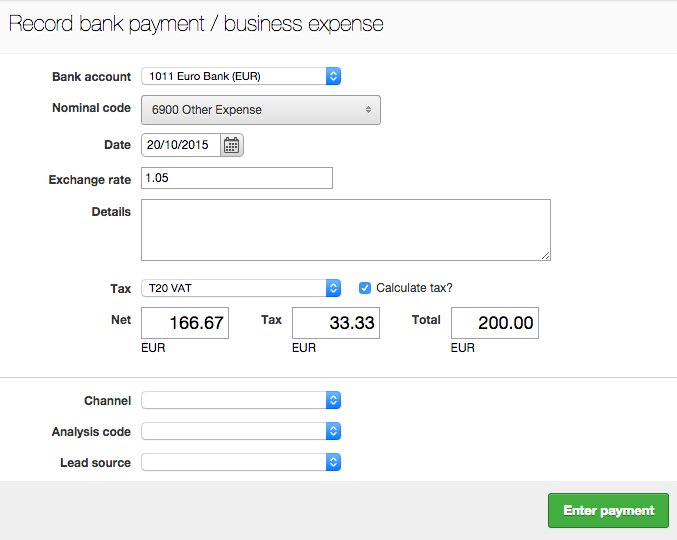 Select the account code relevant for the expenses you are paying. Select the tax code and check the box to automatically calculate tax. To enter your own net and tax values, uncheck the box. (Optional) Use the Channel, Project and Lead Source fields to relate the payment for reporting purposes (these will only be assigned to profit & loss account types). With ad-hoc check printing a single check can be printed from a bank payment. When entering the bank payment specify whether a printed check is required. If the check number is known it can be entered manually, however, the check printing process is capable of auto-assigning the check number. Once the bank payment has been entered, the check can be printed from the list of vendor payments at Vendors > Vendor payments. This applies only when multi-currency is switched on. When a foreign currency bank receipt or payment is entered, the transaction will be recorded in both the transaction currency (bank currency) and your base currency. The base currency value is calculated using the transaction exchange rate. Brightpearl accounting is recorded to 2 decimal places, this means that due to rounding on each journal row the base currency and foreign currency journal totals may not exactly add back up. When this happens, a journal correction row will automatically added to ensure the journal balances. Bank transfers are used to move cash between your bank accounts in Brightpearl. The credit card should be set up as a bank account in Brightpearl. When a payment is made on the credit card from your main bank account you will use a bank transfer to move the balance from the main bank account to the credit card in Brightpearl. Tills are setup as bank accounts in Brightpearl. When you cash up the till and deposit the money into your bank account you will use a bank transfer to move the balance from the till nominal code to your main bank account nominal code in Brightpearl. You will probably have a bank account set up for use with your Amazon channel where each individual order payment is recorded. Every 2 weeks Amazon automatically deposit your takings into your bank account. You will probably want to reconcile your Amazon account and do the same in Brightpearl as well. Go to Accounting > Transfer Money. Select the bank account to transfer from and to. Enter some details about the transfer for future reference. An accounting journal is created and the bank account balances in Brightpearl are updated. A batch bank transfer can be used where multiple values were entered into one account, the balance of which then needs to be deposited into another account. For example, if you take regular, small credit card payments that are accumulated and later transferred to your bank account from your credit card supplier. Each sale should be allocated into the credit card sales account as set up in your chart of accounts. As the period progresses, the balance on the credit card sales account will increase. When the credit card supplier deposits the balance of all the transactions into your main bank account you can use a batch transfer to select all the credit card transactions for the period and move the balance into your main bank account in Brightpearl. Go to Accounting > List Bank Accounts. Locate the bank account from which the items are to be transferred from and click View transactions link. Use the filters to view transactions for the relevant date range. Mark the checkbox for each item to be transferred; the total of selected rows will be shown at the bottom, this must match the balance actually transferred. Click the Create a batch transfer button. Select the bank account to transfer the balance into and enter a reference. Enter the date the items were actually transferred into the account. Click the Create bank transfer button. The total balance of the selected items is entered into the receiving bank account. Each individual transaction will remain visible on the originating bank account but will be marked as transferred with an icon in the withdrawal column. Hover over this icon to view the date and time the transfer was performed. Foreign currency bank accounts are not supported. All bank accounts in Brightpearl are held in base currency. The 100 Euros is first transferred to a base currency bank account and then from the base currency account it is transferred to US Dollars account. 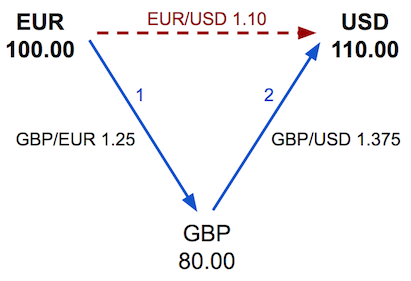 In this example, the first transfer is from the Euro bank account to a base currency (GBP) clearing account. Make a note of the received amount as this will be needed in the second stage. The accounting journal for this transfer shows both the EUR transaction debits and credits and the base currency GBP debits and credits. The second stage is to move the money into the USD bank account. This is done using another bank transfer from the clearing account to the USD bank account. The transfer amount must be the same as the GBP received amount in the first stage transfer so that no balance remains in the GBP clearing account. The exchange rate used must be that which will convert the GBP amount into the final USD received balance required. The accounting journal for this transfer shows both the USD transaction debits and credits and the base currency GBP debits and credits. The result is that EUR 100 was withdrawn from the Euros bank account and USD 110 was deposited in the US Dollars bank account. No balance remains in the clearing account.